Hey, want to know what your future is? Would you pay $700 to find out about it with no guarantee the information you get is right? If so, pick up your phone and give good old Sylvia Browne a ring. She claims she can predict the future but can't give you any sort of guarantee that a $700 reading will be of any value. Sylvia also likes to dabble into UFO abductions. Sylvia got caught on national radio after agreeing that the West Virginia miners would be found alive, but later reversing what she said after the shocking news was released that all but one miner died. (See below) This is how low scum will go. Sylvia says she's on a mission from God. This mission apparently includes selling books, DVDs, tour cruises, phone readings, psychic salons ($1,000 per person), and custom jewelry with asking prices in the three-thousand dollar range. Something else that this 'psychic' doesn't advertise: She reportedly has a felony rap sheet for securities fraud. Alleged psychic Sylvia Browne has been around for a while making claims of successfully communicating with the dead, solving murder cases, finding missing children, and foreseeing future events. Browne is a regular on the Montel Williams Show (pictured left) and frequents the Coast To Coast AM radio program. On 03-JAN-05, Browne was on the air with George Noory as the tragic story of several miners being trapped in a mine after an explosion was being played out. Reports from the mine had left a sense of dread with all after deadly levels of carbon monoxide were discovered in the location the miners were supposed to be. Prior to Browne's appearance on the show, Noory made the incredible announcement on the air that twelve of the thirteen miners had been found alive as the news was making the rounds on every major news wire. NOORY:" Sylvia, this is a momentous day today with these coal miners, at least tweleve of the thirteen being found alive. " NOORY: " Of course this is after the fact, with these 12 of 13 coal miners they found successfully... "
NOORY: "...Had you been on the program today, would [you] have felt if, because they heard no sound, that this was a very gloomy moment, and that they might have all died? " BROWNE: " No. I knew they were going to be found. I hate people that say something after the fact. " Well, Sylvia's own statement regarding her "hate" of people making claims "after the fact" would be her own hypocrisy coming full circle to slap her right in the face on live national radio. 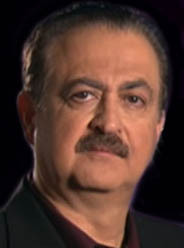 Later in the program, with Browne still on the air, Noory made the astounding announcement of the initial report having been wrong. Tragically, all but a single miner had been found dead. Hopes had been crushed for the families and friends of most of the miners. Can you imagine being a family member or close friend and hearing in one report that, against all odds, all were found alive. Many were elated that husbands, fathers, and sons would soon be joining their family and friends. Jubilation, joyful crying, cheers of relief. But that all ended when the second crushing report came that only one miner was found alive and in critical condition. Heartache, agony, disbelief, despair, anger. To top off all of the loss and sadness, can you imagine hearing some moron on the radio trying to capitalize on the story to bolster their credibility, or to prove they have some sort of amazing power? Well, apparently this is exactly what Browne did...all with the support of Noory. BROWNE: " I didn’t believe that they were alive. " NOORY: " What’s that, the miners? " BROWNE: " Yeah, I didn’t think — and see, I’ve been on the show with you, but I don’t think there’s any that are going to make it. " NOORY: " They say there are 12 gone. I think we threw you a curveball, we were telling you after the fact. " BROWNE: " Yeah, no, I did believe that they were gone. " How can you throw a curveball to a psychic who Noory had earlier touted as having such a "high" accuracy rate? This is just more of the same garbage from Noory (pictured right) where it appears that his fascination with psychics overrides any common sense he might have. ufowatchdog.com was going to e-mail Browne directly and ask for comment, but Browne doesn't do e-mail. An e-mail was sent to her office, and no response was received. On Browne's website it states, "Sylvia does not read e-mail. To speak with her you must call her office for an appointment. Visit our page giving fees and details about a psychic reading. To schedule a reading, lecture, or seminar..."
This would be fine and all, except that Sylvia charges $700.00 for a phone call. And there's no guarantee that your $700 is going to buy you any accuracy. And the call to Browne only lasts twenty to thirty minutes. On Browne's website it states, " You are totally in charge of your life, and should rely upon common sense, sound judgement, and the facts available to you as you make plans for your journey through this world. Look upon a psychic reading as getting directions for the journey ahead. You will still need to make that trip by yourself, and will confront all the difficulties that life presents, but at least you will have some sense that your direction is correct and there is a plan for all the craziness that you encounter. Also realize that there are many different ways to get from one place to another in your life. Sylvia...will outline one path, among many, for you to consider. " In other words, this supposed psychic with such a "high" accuracy rate can't guarantee anything she tells you or what she supposedly sees in the future. She'll gladly take your money, but forget about it when it comes to Browne providing any solid information about your future. As for relying on "common sense" and "sound judgement", gosh, my intuition tells me to spend my $700 on something else. 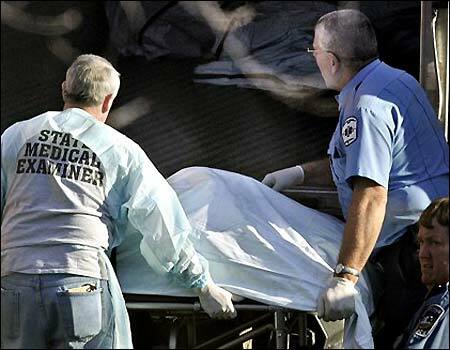 LEFT: The body of a miner is removed from the site of a West Virginia mine explosion. 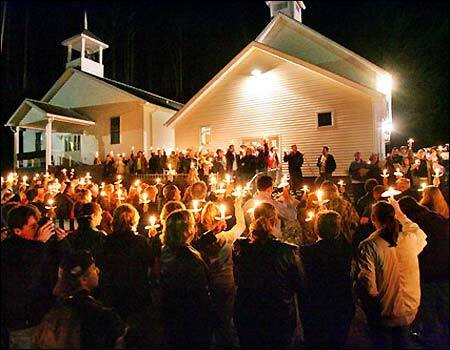 RIGHT: Mourners gather at a church near the mine. Maggots don't care what they eat, just as long as they eat. Vultures don't care about picking their meals off the bones of the dead. Certainly, it appears that Browne isn't at all concerned about trying to capitalize on the tragedy that befell the miners, their families, their friends. While many other words come to mind here to use, not one polite by any means, I think one word can describe this completely outrageous and soulless attempt by Browne to turn this event around in her favor: Sick. In an article written by nay-sayer of all things, uber-skeptic Joe Nickell reports that Browne reportedly pleaded "no contest" to a felony securities fraud charge, reportedly connected to a gold mining investment Browne and her former husband were running (Ed. Note: The article referred to here is gone, but corroboration of this issue is provided in the first paragraph above.) According to the article, one month after the investment funds had been transferred from the investment project to the Brownes' Nirvana Foundation for Psychic Research, the Browne's declared bankruptcy on the investment project. Browne sells books, DVDs, lectures, readings, sea cruises, trance sessions with her supposed spirit guide, custom jewelry, art prints, children's books, newsletters, classes, and for $1,000 per person you can talk with Browne during what she calls a 'Spiritual Salon'. She limits these 'salons' to thirty-five people. Wow, that's an easy $35,000 in pocket. Sylvia Brown appears to be a miner in her own right - a gold miner. NOORY: " Sylvia, this is a momentous day today with these coal miners, at least tweleve of the thirteen being found alive. " Noory clearly says the miners were "successfully" found and clearly asks Browne if she had made a prediction earlier, would she have thought the miners "might have died". Browne's response is, "No." It is after this that we later hear the devastating news of the miners' fate and Browne's reversal from her previous agreement that they were alive to her now saying she knew they would not make it out alive. Browne is caught with both hands in the cookie jar on national radio.